It’s more than how many followers you have on Twitter or how many likes you have on Facebook. This follow Friday we look at the importance of measurement for all campaigns and business optimization strategies from analytics guru, Avinash Kaushik. 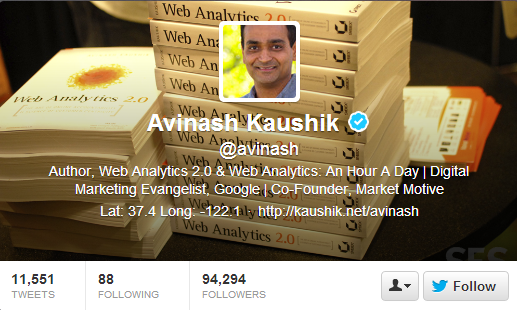 Author of Web Analytics 2.0 and Web Analytics: An Hour A Day, Kaushik is the Digital Marketing Evangelist at Google. A thought-leader and expert in gaining actionable insights from analytics efforts, @avinash evolves approaches to online marketing and communications. Why do Web Analytics Matter? Google analytics gives insight into user behaviour and knowing what your audience likes is a great way to find out what content is of most interest to them and how to keep them coming back to your site. Data used from web analytics also provides insight into how to make better decisions moving forward and how to improve performance for the organization. But before you do any measurement, you should always have a measurement plan. At the end of the day PR and marketing activities should always help drive business goals. Are you getting optimal use out of your online platforms? Follow @avinash, read his blog Occam’s Razor and stay current with his wisdom into the wonderful world of web analytics.